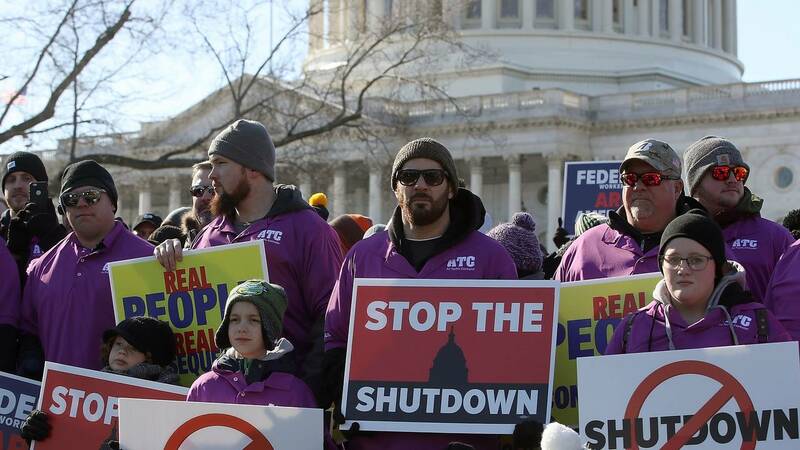 People rally against the partial federal government shutdown outside the U.S. Capitol on Jan. 10, 2019, in Washington, D.C.
(CNN) - As the partial government shutdown nears the one-month mark, there have been a number of public opinion polls examining how the public feels about the shutdown, which was sparked by a funding standoff over President Donald Trump's proposal for a new wall along the border with Mexico. Six high-quality polls have been released this week touching on Trump, the shutdown, the Democrats in Congress and the wall. So, Americans oppose the strategy of shutting down the government, but is that because of the wall itself? Or the government? Probably both. Further, the Pew survey found that only about a third of Americans (34%) said that expanding the wall would lead to a major reduction in illegal immigration to the US and, according to Quinnipiac's poll, 43% of voters feel a wall is an effective way to protect the border. Both polls found sharp partisan divides on the matter: In the Pew study, 69% of Republicans and Republican-leaning independents said it would reduce illegal immigration vs. just 7% among Democrats and Democratic-leaning independents, and Quinnipiac's results show 87% of Republicans consider the wall effective protection for the border, while 95% of Democrats say it is not. It's becoming clear that the shutdown is an issue for American's perceptions of the government. In a Gallup poll released Wednesday, the number who cited the government as the most important problem facing the country today went up from 19% in December to 29% in January. But even this is driven by partisanship. In the Pew poll, 79% of Democrats and Democratic-leaning independents say the government shutdown is a "very serious" problem for the country, just 35% of Republicans and Republican-leaning independents feel the same. Majorities disapprove of the way Trump (61%), Republicans in Congress (60%) and Democrats in Congress (53%) are handling negotiations over the shutdown, according to Pew Research. And most Americans are blaming Trump for the shutdown. In each of four polls that asked respondents to place blame, majorities said that lies with the President, while about a third in each cited Democrats in Congress as primarily responsible. The President's overall approval has definitely taken a hit, too. Not all polls showed a substantial downturn from where he was in December to where he is now, but taken together there is clear downward movement in his ratings. One of his biggest losses has been among white Americans without college degrees, an important base for Trump. In the new polls, four surveys conducted among all adults found approval ratings below 40%. Back in December, before the shutdown began, polls conducted using the same methodology found a wider range of approval ratings, including several over 40%. Each of those findings on their own wouldn't amount to much, but the consensus across polls suggests real movement in the public opinion.